The Food Court is an exhibition and Arts project space for emerging and established artists, located in the Docklands in an abandoned Food Court. We provide an unconventional and affordable space for artistic projects and events, with wider objectives of fostering artistic experimentation, social and public space activation as well as community exchange. 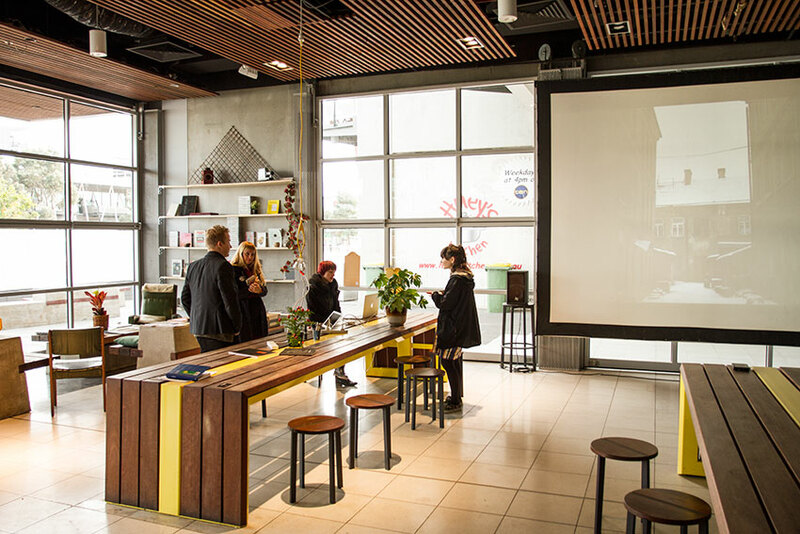 The Food Court is made possible by Docklands Spaces, Renew Australia, and the generous supporters of our Pozible Campaign. Nico Reddaway is a Melbourne based artist working primarily with media, installation and performance. Her work eloquently merges self-performance and video. Drawing on themes of identity and transformation, Reddaway’s work gives the viewer unique passage to the spectacle of the absurd. Nico Reddaway completed a Bachelor of Fine Arts in Media Arts at RMIT University, in 2012. In 2013 and 2014 she has exhibited and performed at various galleries and festivals including Melbourne Fringe Festival, Gertrude Projection Festival, The Next Wave Festival, White Night Festival, RMIT School of Art Gallery, Colour Box Studio, Testing Grounds, D11@Docklands, Lincoln Art Centre, First Site Gallery, Yarra Sculpture Gallery, and Donkey Wheel House. Reddaway has been gaining industry experience interning for Channels: The Australian Video Art Festival and has previously held intern and volunteer positions for RMIT Gallery, ACMI, MIFF and Next Wave Festival. Amie Anderson is a Melbourne based artist who seeks to enquire into social systems and systems of knowledge through various projects, often exploring and documenting with archival methods of collecting and utilizing video, performance art and installation. Her work recurrently displays a strong interest in breaking down social barriers through art, creating opportunities for exchange and both inter-human relations and personal experiences. In pursuit of this, her work is approached as a kind of extrasensory investigation, one which invents new kinds of knowledge, sustains intuition, and disrupts our sense of ‘self’ in the world. Resulting works occupy both the space of the banal and the miraculous. The body, particularly her own, often becomes a natural extension of her work; a conduit through which actions and ideas flow, touching on the nature of our corporeal existence. Amie is also an artist mentor and facilitator with Art Circle – Yooralla; an initiative that creates inclusive networks between artists with or without disabilities, leading to independent and visible practices within the arts community. Clare Walton is a Melbourne based artist and owner/creative director of Visual Feast Creations. Clare has over 10 years experience within the community arts industry having worked with organisations, councils, schools, festivals and community groups across Australia and overseas. Her experience ranges from curating shows in London and Cork (Ireland) to designing and facilitating workshops, residencies and school incursions in Victoria, NSW, WA, QLD and North Eastern Arnhem Land. Having originally trained in Fashion Design and Millinery her personal work is still very much influenced by this. Her work explores the beauty of the unseen natural environment. Clare has exhibited in various group shows including Come As You Are at The Food Court in 2014 and held solo shows at Victoria University Foyer Gallery 2012 and as part of the Melbourne Fringe Festival 2013. Megg Minos is a writer who works across the disciplines of poetry, short fiction, creative non-fiction, writing for the arts and ficto criticism. She has won the Visible Ink Short Story Competition, been commended in the My Brother Jack Short Story Award and widely anthologised. Her work is often research based, using historical archives and oral histories. Jonathan Homsey is a choreographer/producer striving to create work that connects the movement of hip hop dance with conceptual practice. Born in Hong Kong and raised in USA, Jonathan moved to Melbourne in 2010. Jonathan has had the pleasure to be a co-founder of the groups Sole Symphony Movement, and Menagerie Dance Co-operative. He is currently working on Vessel, an installation using aroma and sound therapy juxtaposed with street dance movement to explore how a performance can have medicinal properties. As a producer he is passionate to work with small arts organisations for audience development and community outreach. Jess Wilson is a Melbourne based artist, comic writer and curator. Her art practice uses installation, painting and paper cutting to fabricate new spaces and environments, immersing the audience in an artificial climate. Wilson has shown in galleries such as: Trocadero Art Space, 100 Gallery, the 100 story building, West Projections Festival and Fawn Gallery. She has curated several shows at Trocadero Art Space over the past five years and assisted in Curating the Trocadero NEWER award for the past three years.